The Yaesu FT2DR provides sophisticated 2 meter/440 HT operation in traditional FM mode and C4FM FDMA digital modes. The 1.7-inch high resolution touch screen display provides loads of information through an easy to navigate interface, providing stress-free operation and a high level of on-screen visibility for the FT-2DR operator. 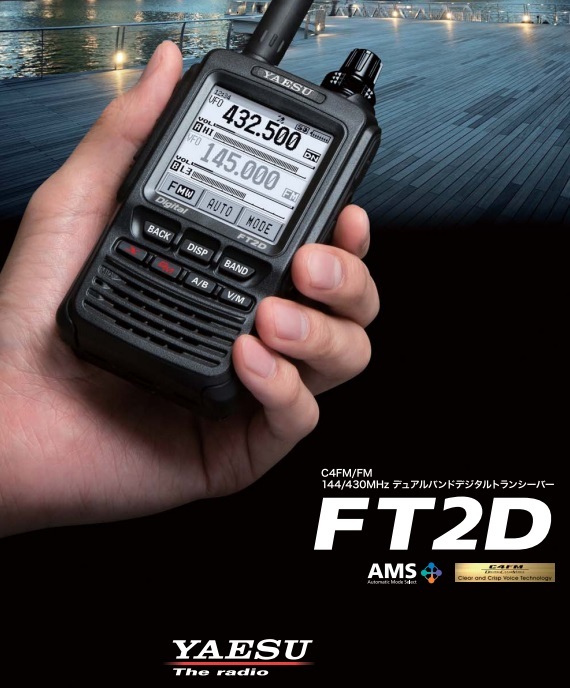 The FT2DR is equipped with Yaesu’s versatile AMS (Automatic Mode Select) capability providing FM friendly digital communications that instantly recognizes either digital or FM analog communications This enables co-existence between various modes. It has standard System Fusion features such as (but not limited to): Snapshot with image data transmitting (requires MH-85A11U), Smart Navigation, Digital Group Monitor (GM) featuring position data and ID data transmitting during transmissions, and full support for the new WiRES-X System. Other enhancements include: 700 mW clear loud audio, built-in High Sensitivity 66 ch GPS with antenna, 1200 bps/9600 bps APRS® function, Dual watch (V/V, U/U/, V/U), Dual Monitor (C4FM Digital/C4FM Digital), GPS Logging/Recording capabilities, Water resistant (IPX5 Rating) and MicroSD Card Slot. This radio comes with antenna, belt clip, USB cable (not for programming), SBR-14LI Li-ion 2200 mAh high capacity battery and SAD-18B AC wall charger.